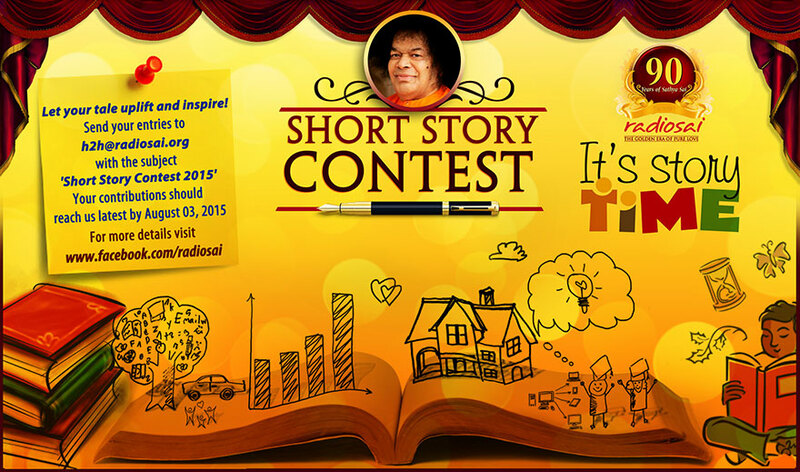 Radio Sai Short Story Contest - Let your tale uplift and inspire! Let your tale uplift and inspire! “Once upon a time the King of Gods who had three mighty weapons decided to test his five ministers...” Now the class suddenly became silent. All ears were perked up. All eyes open and all mouths shut. In a trice, the cacophony of the class had magically turned into a symphony of silence. Instead of tiny tots if the audience consisted of mid-lifers or super seniors, the situation would have been no different. In fact it would work wonderfully even if it was a corporate boardroom or a science colloquium. The power of a story, be it real or imaginary, to solidly pass on a message is incontestable. Indeed it is attested even by the Gods. Whenever the Divine takes a human form He too resorts to this time-tested technique. That is how we have Jesus' Parables, Jataka Tales, Spiritual Stories by Ramana, and of course Baba's Chinna Kathas. Every tale first captures our attention and then silently implants an idea - an idea that at times could transform our life forever. Just like Gandhiji had to see the story of Sathya Harish Chandra just once to devote his life to Truth. Therefore you never know the power packed in a parable. While listening to stories is captivating, what is really enthralling is when we end up creating such a masterpiece. And if it is a tale that can transform someone's life for the better, our creativity just feels so fulfilled. • The stories should be original. Pray to Him for inspiration and pen down your creation. • Ensure that your tale is not more than 900 words. • Send your entries mentioning your name and country to [email protected] with the subject 'Inspiring Story Contest 2015'. • Your contributions should reach us latest by Aug 03, 2015. • Once we receive your entries we will first place all of them at Bhagawan's Lotus Feet at Sai Sannidhi in Sai Kulwant Hall. • They will next go to our panel of judges and by Mid-august we will announce the results on our website. Soon after this, we will share with the winners a few Radio Sai tokens of love. • Most importantly, we will carry all the commendable entries on our website after getting special illustrations done to enrich the stories. So do take this opportunity to pray, ponder, pen down and share! What do you think about this Contest? Please let us know by writing in to [email protected] or you may leave your thoughts in the comments section. Do not forget to mention your name and country.